I don’t know why it’s fuzzy, but you have to read it. It’s so good you’ll opt to wet yourself just to avoid having to put it down long enough to use the toilet. Justin Cronin’s The Summer Guest. Go get it. Are you getting it? Go get it. I fell in love with her when I read Still Alice, but this one made me want to marry her. You could borrow mine, but I’m still trying to wipe the drool off it. It’s that good. 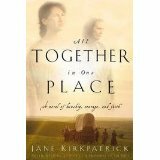 anything I could get my hands on by Mary Barmeyer OBrien, this trilogy by Jane Kirkpatrick, and a couple others. I’ve shelved Love Wins. No offense, Rob, but I don’t want to talk about hell in the summer. I want to talk about summer things and traumatic brain injuries and the Oregon Trail. Maybe fall is more of a hell-reading time. We’ll see. This is me being real. And saying you have five weeks left of summer. What are you waiting for?